A very distinct but yet closely related to Panthera bigcats than to other small wildcats, clouded leopards Neofelis spp. are the smallest bigcats that come under the Pantherinae sub-clades of Cats. There are very less information available of the bigcat in their natural habitat, since these are among the most secretive and elusive ones of all the cats. Most of the information that experts know about this cat come from their study and observation on captive ones. They are believed to be highly adaptable in canopy regions of dense forests, their features such as very long tail, wide paws, short limbs make them very perfect predators on trees. Another special character which is also reserved to another cat species, Margay Leopardus wiedii, is that their hind leg ankle joints can actually rotate so that they can grip the branches of trees while descending as similarly as how a squirrels would do. This feature make them able to climb down trees head-first making them the only Pantherinae bigcats that can do such arboreal acrobatics, although common leopards are too a highly able climber. Marbled cats Pardofelis marmorata has also recently been observed to show this behaviour, this just shows how less we know about these cats and they have already become rare by the time we know these things. Clouded leopards in captivity are known to hang upside down the branch, also walk through the branch hanging upside down, and actively jump along the branches. 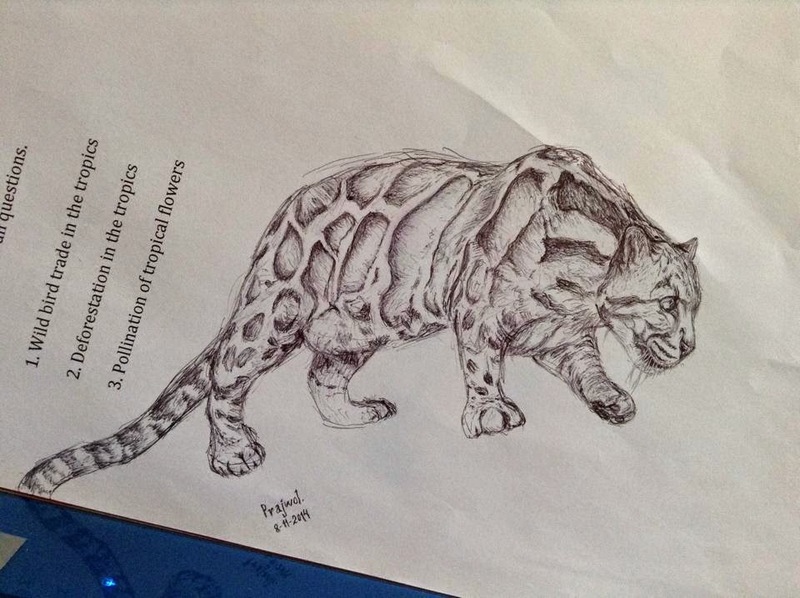 The texts in the background are exam questions from one of my courses, I later realized that they actually relates to the problems that these bigcats are facing in some direct/indirect way, so I didn't crop them out. That was a brief and quite a few valuable information about this elusive bigcat. But where are these elusive cats living? Their range is mostly concentrated in the South-east regions of mainland Asia as well as Sumatra and Borneo islands, and their distribution extends towards Southern Asia also. Throughout their range, they are patchily distributed most probably due to their habitat loss. In the southern asia, countries like Nepal, North-east India, Bhutan, Myanmar has suitable habitats for clouded leopards. While in the south-east asia, countries like Thailand, Myanmar, Vietnam, Indonesia, Cambodia, Laos, etc. has some of the last populations of clouded leopards. Until last decade, it was believed to comprise of a single species, however researches conducted based on morphological as well as molecular data have found out that they are actually two species. The mainland clouded leopard Neofelis nebulosa that are distributed along the mainland Asia, both south and south-east. And the islands of Sumatra and Borneo has a distinct species, also known as Sundaland clouded leopard Neofelis diardi. Although estimated to be less than 10,000 globally living clouded leopard population in the wild, it is completely based on estimation which can be much more lesser in the actual figure or close to it but probably not more than that. With fragmented habitat, no single populations are believed to comprise of more than 1000 individuals, this too being an estimation and the real figure can be much more lesser based on the disturbances present in the habitat regions. The region where they are thought to be present in highest densities are going through the highest rate of deforestation today. Due to commercial use of the rainforest in south-east asia for production of palm oil for example, their habitat is in danger, and therefore so is the cat. With their one of most beautiful spot patterns, they are becoming the target of poachers mainly for their demand of pelts, as well as bones and other body parts used in traditional chinese medicines (TCM). Also, due to lack of healthy numbers of suitable wild prey, these cats get forced to enter human settlements in search of food, such as poultry, dogs, pigs, goats, etc. and thus becomes the victim of retaliation, although being just twice as large as domestic cats, they are not that much of a threat to human life. In order to save and better understand the behaviour of this elusive species, there has been efforts of captive breeding programs, which has proven to be quite challenging unlike the case of other bigcats. Most often, the males have been observed to turn out very aggressive during mating, leading to life-threatening injuries to females and sometimes even killing their mate. Successful breeding chances are observed to be high only when the pairs are introduced from their earlier years when they are still young. Due to such challenging issues in breeding, the clouded leopards are also among the lowest numbers in captivity of all bigcats. To some extent, these project initiatives may help save the species, possibly even taking the measure to rewild the captive cats back into a viable habitat one day. But still, a real conservation would always be an in-situ directed conservation i.e. conserving the clouded leopards in their natural and wild habitat. They have lost most of their habitats in the last century as any other large carnivores especially bigcats, conserving their last remaining habitats is what we should focus mainly on right now. Throughout their ranges, clouded leopards have been very poorly studied. Most of the research focuses on the south-east asia regions of their range, but there is lack of enough data from the south asia regions. 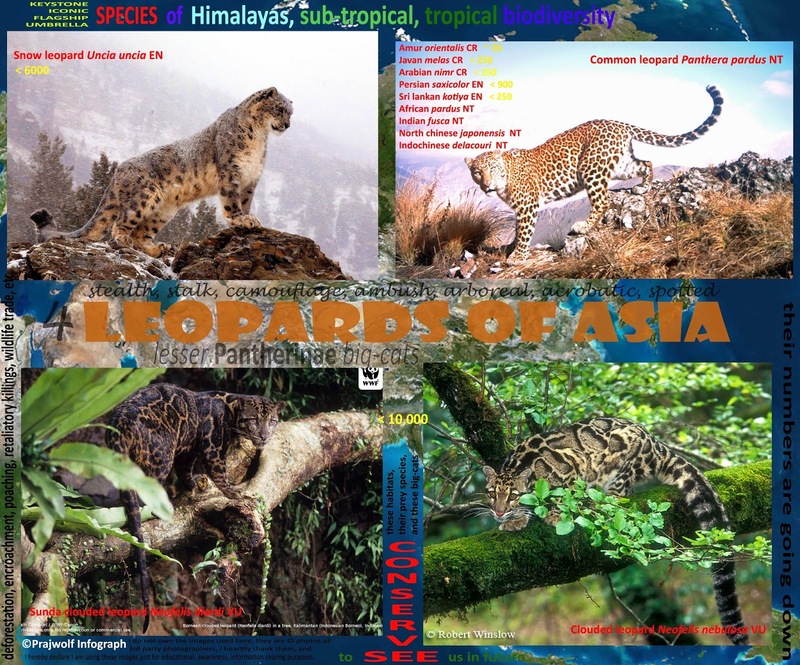 Also, some dedicated organization focuses on their fund granting towards the south-east asia based projects probably due to lack of enough available funds and very low density of the clouded leopards in south asia regions or maybe just that we know very few about their actual distribution in the south asia regions. I myself being from south asia region, Nepal, is more concerned about their conservation needs in this region too. Clouded leopards are an interesting species of wildcat that are facing a risk of getting extinct in the near future as same as any tigers today. People are unaware of their endangered status as well as the strict and improving protection against tiger body parts trade is shifting the demands of TCM towards other wildcats such as lions, leopards and clouded leopards. Just recently, a review paper published reported about seizures of wildcat body parts during 1991-2014 and it was found that the trade in the parts from clouded leopards were the most common ones among asian species of wildcats. The review was based on illegal trades from Myanmar-China and Myanmar-Thailand border regions. Nepal has been a hub for wildlife traders en route to Tibet and China through India due to open Indo-Nepal borders. A recent changes in the law and order has improved and solved these issues to some extent, where Nepal has accomplished a zero poaching of tigers, elephants and rhinos for 3 years, with rhinos being an exception in which one or two have been poached during this time. Very less is known about any other wildcats trade, such as common leopards, clouded leopards, leopard cats, marbled cats, and so on. A study in the assessment of clouded leopards ecology conducted in a part of mountainous region of mid-eastern Nepal did not find out any clues of a living clouded leopards there, but two pelts of clouded leopards were discovered in the locality near the research area. This has proven two things, one that there are clouded leopards living in the region, another that how worst is the situation of their conservation in the region. The people are involved in such illegal activities, and not much is being done from the national or governmental level for the conservation of these endangered bigcats. Poaching being the most problematic threats for their survival, habitat destruction is also no less of a serious problems that these cats are facing today. The geography of Nepal possess a wide diversity from the highest Himalayan mountains in the northern belts, then mid-hilly mountains of Sivalik and Mahabharata ranges, and the plains of Terai Arc Landscape (TAL) in the southern lines. Clouded leopards have been found or believed to exist along all three major landscapes, but their densities are found mostly concentrated along the himalayan foothills and mid-hilly (HFMH) ranges. A recent camera trap study focused on tigers in a TAL regions have captured images of 3 individual clouded leopards making it the first strong documented records of clouded leopards from TAL region specifically in Chitwan National Park (CNP), although previous reports were been made about their presence there but quite not that strongly reported. Elsewhere in the HFMH regions, clouded leopards existence is documented in few regions strongly through camera traps data such as Annapurna Conservation Area (ACA) and Shivapuri Nagarjun National Park (SNNP), which lies towards mid-western and central regions of Nepal respectively. Anecdotal informations regarding their presence in eastern as well as some far-western regions are also available, and thus these needs validation through improved and strong research evidences as well as their status assessment is highly needed to ensure their proper conservation measure. Nepal has green hilly montane forests along the foothills of Himalayas which has been a suitable habitat for many endangered species, making it a rich biodiversity hotspot region. When we view the regions of protected areas over the distribution ranges of clouded leopards, there are lots of fragments clearly seen. The law and order of Nepal is mostly focused within the protected areas, which means that the situation of these cats outside of protected areas are even much worse and very very less known. Note: Pale regions are the distribution map shown by IUCN, Darker regions are the protected areas in the regions. The overlaps are highlighted with even darker and dotted borders, more details are mentioned in the warning section in the image. The recent records from CNP about the existence of Clouded leopards have increased the need for their behaviour pattern and status analysis since the TAL regions of Nepal also supports dwindling numbers of tigers which has received much of attention from protection point of view. This ensures to some extent that the clouded leopards in CNP are much more protected than other places. Common leopards Panthera pardus are distributed throughout all major geographical regions of Nepal, although its not going to be long that they would be as common as what their common name suggests, since common leopards are the most misunderstood among the bigcats, and their adaptable characteristics have made them come in conflicts with people, with even the situation getting worst in the capital city of Nepal. Common leopards are facing the conflict situations mostly because of habitat fragmentation, destruction and encroachment. It is known that the clouded leopards and common leopards co-exist along the HFMH regions, but as is the case of common leopards coming into conflicts with humans, the clouded leopards status is worsening because these cats are very much secretive and the habitat loss is causing them a serious risk of getting rarer and rarer, and thus also less likely comes into conflict with humans, although there have been some cases of conflicts. However, clouded leopards wouldn't be of a huge threat to the human life as that of common leopards, although common leopards also rarely attack humans, yet they are just misunderstood among the bigcats. Due to the successful conservation measures and seriously dedicated private, governmental and national, international level conservation parties for tigers and snow leopards, the importance about the conservation needs of clouded leopards and common leopards are hugely being neglected or at least not much given an attention towards. At least the clouded leopards have the status of protected species in Nepal, but common leopards case is even much worse which is not yet considered a protected species, although poaching and hunting is completely checked and regarded illegal. There is so much in common among these two neglected bigcats, that either of their thorough studies and research would in some extent help protect both of the magnificent cats. The conservation of both of these two bigcats could go hand in hand if there ever comes a dedicated bodies and along with them, their supporters as funds providers. However, due to unavailability of enough funds and lack of attention and interests from the national and international level, few of such dedicated organizations are not being able to take their efforts to higher levels. Taking all these things into consideration, a conclusion could be briefly prepared that the requirements about the conservation measures of clouded leopards are highly needed, not to mention the situation of common leopards as important as cloudies. I have decided to dedicate the rest of my life, believing that I would live for another 40 years or so and there will be at least 4 or 5 generations of these bigcats up until then, studying and trying to better conserve and protect these wonderful bigcats. If there ever comes an opportunity for achievements during this endeavor, I would want to make it my life goal focusing on the conservation of these two wonderful distantly related so-commonly called leopards, or I would rather say the leopards of Asia along with snow leopards. How are Leopards and Clouded leopards in Nepal?